Here is the original and slightly longer version of a piece of mine which appeared in the Wichita Eagle this morning. Last week the Kansas Senate approved a bill that will, if it becomes law, move our local elections from the spring to the fall in odd-numbered years. That would be a good change, I think, especially in light of a poor turnout--fewer than 20,000 votes cast, which is less than 10% of all registered voters here in Wichita, KS--we just saw in our mayoral primary. Anything to make it more likely more citizens will tune in is, I think, worth trying. But at the same time they also dropped a provision in the bill that would have made it possible for political parties to directly involve themselves in local elections, specifically by organizing them around partisan candidates. They dropped it mostly because dozens of school boards and city councils across the state complained, making arguments on behalf of the nonpartisan status quo. I disagree with those complaints. The legislature's decision not to go forward with that change was, I think, unfortunate–and the mayoral race we now have here in Wichita proves why. The problem isn’t the mayoral primary winners. Jeff Longwell and Sam Williams are both successful businessmen and committed public servants, with long records of civic involvement and volunteerism. I’ve no doubt that either could make an entirely competent, perhaps even inspiring, mayor of our city. 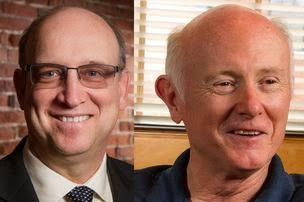 But unless their respective campaigns over the next four weeks genuinely surprise us, revealing as-yet unnoticed philosophical and policy differences between these two gentlemen, it is also probably fair to say that Longwell and Williams do not, in themselves, represent a particularly broad range of options or interests when it comes to questions about how Wichita is to be lead. After all, they are both--as is pretty apparent from their records, public statements, and advertisements--financially successful, business-friendly, mainstream white male conservatives from Wichita’s west side. That’s not necessarily a criticism (I’m a white male west-sider myself). But I wonder just how engaging this race would be to all my neighbors if we’d ended up with two finalists for mayor who more obviously embodied the concerns, experiences, and aspirations of voters from Wichita’s poorer, or more diverse, or younger neighborhoods? This is where parties come in. Everybody claims to hate partisanship, and it’s true that the way the national parties operate today is highly dysfunctional. (That's not entirely their fault, since--as has been much discussed lately--the incentive structures of our whole mass democratic electoral system have become rather perverse over recent decades.) But like it or not, parties are one of the few successful ways we have to actually organize and bring into the democratic process the huge range of attitudes and perspectives contained amongst the American people. You may not like the candidates which the Republican or Democratic parties present you with, and you may not care for the track record or agree with the platform of either party, but it remains a fact that when candidates are identified as “conservative Republicans” or “liberal Democrats” or some other combination thereof, it gives us information that we can make real choices about. Nonpartisanship, with its focus on straightforward issues of management, surely has its place in some elections–such as for school board members, when the responsibilities of those elected are usually narrowly defined, representing as they do a very specific segment of the population. Perhaps some truly small towns are well served by nonpartisan elections also. But a city the size of Wichita? Where we can easily see, as we look from west to east, north to south, numerous pockets of genuine racial, cultural, and ideological difference? No electoral system could ever perfectly capture all those diverse agendas, especially since voter turn-out amongst those populations differ so widely. But political parties, by organizing different economic, ethnic, and social factions and establishing distinct sets of policy ideas, would at least serve as a vehicle for some of those agendas, and the candidates who reflect them, to make it on to the final ballot. Wichita is a large, complex, diverse city. Cities like our needs parties, for all their flaws, to be able to give everyone, even those perpetually in the minority--which would include folks who vote for more left-leaning policy solutions like me--a consistent political voice, and thus the possibility to electorally make their case during the main event. And besides, at the very least, they would likely also give voters electoral contests more worth getting excited about. Saturday Night Live Music: "I'm Still Here"
Saturday Night Live Music: "The Ghost In You"